Welcome to the Garden Of Thoughts where every large tree, beautiful flower, plant and herb, every living plant is a thought. Some of the flowers, plants and trees are quiet, nurturing thoughts. Some are vibrant life changing thoughts. And some are the thoughts that extend through time, that span generations, and form the basis of some of the most powerful ideas that carry humanity forward into a higher focus. Join me as we meander and stroll through the Garden Of Thoughts and enter a world where your thoughts matter. Let’s do a little gardening and take care of this beautiful world. 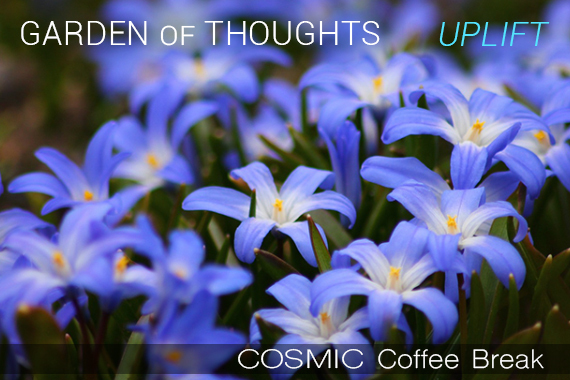 This episode of the Cosmic Coffee Break has a special meditation to empower, bless and clear your thinking.